In its ongoing quest to rebrand the Beetle, Volkswagen plans to unveil the high-performance Beetle R at the Frankfurt Motor Show in September. The new Beetle R will most likely produce an output of around 240hp and would be powered by the same 2.0-liter I4 that produces some 270hp and 258 lb-ft in the upcoming Golf R. However, the Beetle R will remain front-wheel-drive as opposed to the Golf R&apos;s all-wheel-drive. This would help keep down the former&apos;s price. Volkswagen is also considering whether a possible Beetle R cabriolet would produce enough sales to justify construction. If VW does green light the Cabrio, it will be offered in the US market and would also offer plenty of special editions with various paint schemes. The Golf R, however, is expected to arrive in the US sometime next year. 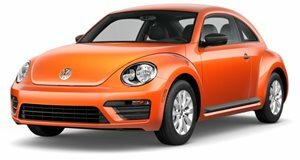 Pricing will begin somewhere in the $30,000 range, nearly $6,000 less than the current Beetle Turbo. Volkswagen will provide more details and power figures for the Beetle R as we get closer to the Frankfurt Motor Show in September.